Smiley Pool from the Dallas Morning News tries to shoot 3 - time national all-around champion Blaine Wilson as a cable puller walks through the background. I was scanning the classified want ads the other day thinking that maybe I should be prepared in case this photography - thing just doesn't work out for me. A national over-the-air TV network is seeking qualified people to work Olympic qualifying events (gymnastics, swimming and track & field) with the possible advancement to the big-time, the NFL (oppps, we lost that one a few years ago). We are looking for people qualified to "pull cable" at major sporting events, following around our talented crew of camera-pointers, making sure that they do not become tangled up with spectators, athletes, mascots and officials and most importantly: get in the way of sideline still photographers as much as possible. Applicants must have a minimum of a GED and failing that, the intellectual capacity to at least read a Spider-man comic book all the way through. Applicants also must be at least 6 feet - 2 inches tall and weigh in the neighborhood of 320 pounds. Applicants must exhibit the ability to stand in front of as many spectators and sideline still photographers as possible. Also the ability to ignore rules and the screams of people that you are blocking is a necessity. A surly, profane attitude is helpful, but not a requirement. The ability to say "F**k you we paid for this event" in 3 or 4 languages is also helpful, but not a requirement (those that have a certificate from the "Homer Simpson School for Cable Pullers" should already have those skills). Applicants must supply their own wardrobe to work as a network cable puller. Old jeans, tank tops and biker t-shirts are recommended. Unprofessional -looking cutoff pants are frowned upon, but tolerated. We ask that all our cable pullers wear tennis shoes or boots with chains, however flip - flops are fine for indoor events. Also note that for men, shaving daily is optional. Applicants will be supplied with all the necessary gaffer tape, hooks, wires, clips, bongs and cigarette lighters. We only ask that our cable pullers supply their own gloves (we recommend the cool ones with the finger tips cut out which is available at any movie expendables house or Samy's Camera). Network cable pullers also reap the benefit of being part of the television industry. Unlike those in the journalism field, our personnel can take all the freebies they can carry. While coverage of the U.S. Olympic Gymnastics Team Trials held recently at the Anaheim Pond ran smoothly, problems with the network TV camera cable pullers were a bit of a problem, sparking my tongue-in-cheek want ad above. One cable puller makes himself at home as another stands up blocking a view of the high bar during the U.S. Olympic Gymnastics Team Trails at the Anaheim Pond. I hate to paint with a wide brush --- there was one particular cable puller, a woman, who was especially nice to the photographers at the Gymnastics Trials, often looking over her shoulder to see if she was blocking someone and would move or kneel to get out of our way --- but she was the one of the exceptions. While I know that the cable puller is a necessary evil for the beast that is network TV, simple civility and courtesy sure would be nice. 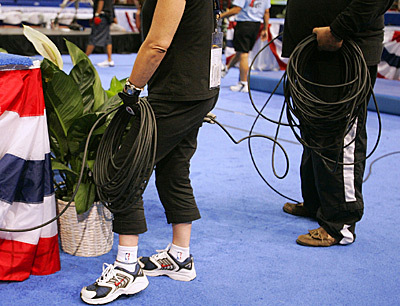 I once witnessed a cable puller (who the USA Gymnastics people took to calling "Shrek") spot a local photographer nearby and then proceeded to deliberately step right in front of him to block his view of the floor exercise. While the above classified ad is making fun of the situation, it does point out a problem, one that seems to be getting worse and worse as sport edges closer to reality TV and away from being "news". Despite rumors to the contrary, the Sports Shooter Workshop & Luau 2004 is NOT closed and we are still accepting registration for THE coolest event in photography. I have received several emails and calls the past few weeks from people inquiring about registering and all said they "had heard that the Luau was full." We do have a quota for student and non-student sign ups and the registration site will be closed when we hit those numbers. But as of now, we still have room. The Sports Shooter Workshop & Luau will be held Nov. 5 - 6 at the Redondo Beach Marina Crowne Plaza Hotel. I have received over 400 registration forms and at the moment, we have over 300 confirmed. If you are planning on attending, register using the on-line form at sportsshooter.com. And stay tuned for some exciting news about additions to the line up for The Luau! The June edition of Sports Shooter features a look at another sore topic for photographers, the antics of Tiger Wood's caddie at the recent U.S. Open. Veteran golf photographer Darren Carroll gives us the lowdown on the incident and his take on caddie (or is it Tiger?) verses photographers. Also this issue we have a fascinating article on aerial photography by Cameron Davidson, Rod Mar gives us a user's report on the new Canon Mark II, Tom Dahlin goes BIG with remotes at the NBA Playoffs and Brian Davies writes this month's In The Bag ... with a bit of a "retro" flare. The Photodude reappears after a two-month absence, Reed Hoffmann rants about digital myths and Bob Deutsch writes about the proper care for those compact flash cards. We have another great issue ... sit back, adjust the volume on that Lydia Pense & Cold Blood CD and enjoy Sports Shooter v. 68!